The streets of Zimbabwe's main cities are deserted during a nationwide stay away to protest at the lack of jobs and unpaid wages. The protests were organised through the messaging site WhatsApp but it is not clear which group is behind it. The internet was often unavailable on Wednesday morning but the government has denied blocking it. The BBC's Brian Hungwe in the capital Harare says it is one of the biggest protests in many years. 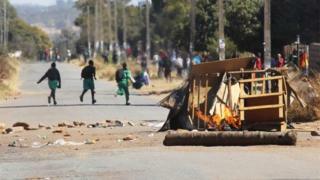 Protesters also set up burning barricades in Harare. Some of the messages calling for a stay away also urged President Robert Mugabe to step down. The 92 year old has governed the country since independence in 1980. On Twitter, activists have been using the hashtag #ShutDownZimbabwe2016 to mobilise support. Many civil servants have not been paid in more than a month - they went on strike on Tuesday. On Monday, taxi drivers complaining about police extortion clashed with the security forces in parts of Harare. The economy has also been hit by currency shortages and a severe drought. "I can't go to work when the rest of the country is not going to work," Sybert Marumo, who works for an electrical shop, told the AFP news agency.